Before studying the information that the various katas contain, it is important to understand exactly what that information is for. Karate is a civil tradition and hence the fighting methods recorded within the katas are for use within a civilian environment. The applications of the karate katas are for use against the attacks of the violent and untrained, they are not for use against a skilled warrior on a battlefield, or in a sporting contest. The methodology applied in the katas is ideal for self-defence today (if correctly interpreted and expressed). There is very little difference between a civilian fight in feudal Okinawa and a civilian fight today. However, the way in which battles are conducted has radically altered. A samurai warrior armed with feudal weaponry would not last long against the missiles, tanks, etc. employed by their modern counterparts. The weapons of war may have evolved a long way, but the human body has not. Two unarmed civilians brawling in an Okinawan street would employ similar methods to two unarmed civilians fighting in a modern city. In order to understand and apply the methods contained within the katas, it is necessary to understand the nature of civilian combat. What we will be looking at in this section is what happens at the start of fights, not what caused the fight to begin in the first place. "Why" fights start is beyond the scope of this text, but I feel this aspect deserves a brief mention, as it is very important when discussing self-defence. I would encourage you to research why fights begin in great detail, as it is with this knowledge that fights can be effectively avoided (Geoff Thompson's "The art of fighting without fighting" is well worth a look). Try to avoid placing yourself in locations or situations were violence is likely. Also, be sure not to make yourself an attractive target to any would be attackers. Keep all valuables out of sight, park your car in well lit areas, avoid isolated places, travel with the car doors locked, avoid suspicious looking people and situations, don't consume too much alcohol, walk towards oncoming traffic, keep away from aggressive individuals or groups, do not stop to talk to strangers etc. Be aware of your surroundings and should an undesirable situation start to develop, you may be able to avoid it all together, and if you can't, then at least the element of surprise is lost to your assailant. Gichin Funakoshi (Karate-Do Kyohan) wrote, "The secret principle of martial arts is not vanquishing the attacker but resolving to avoid an encounter before its occurrence. To become the object of an attack is an indication that there was an opening in one's guard and the important thing is to be on guard at all times." A fight avoided is a fight won. Good martial artists are secure enough in themselves, and humble enough, to be able to walk away from a fight. It is a sorry state of affairs when an individual's ego prevents them from avoiding violence. A true martial artist will have the wisdom to avoid placing themselves in danger, and the compassion to avoid placing their opponent in danger unless violence becomes absolutely necessary. If you have done everything possible to avoid the confrontation, you will be unfettered by any moral concerns, as you know that harming the opponent is now the only option left available to you. If your awareness is not what it should be, the opponent will be able to take you by surprise and hence will have a large advantage. As you'll be aware, the katas should always be performed with Zanshin (awareness) and hence they will further develop that awareness and serve to remind the kata's practitioner of its importance. If the opportunity for ambush is lost to the opponent they will have no option but to attempt a direct attack. As an aside, directly approaching an individual takes greater courage on the part of the assailant, as the potential risk - either in terms of physical injury or the fact that others may be alerted to their activities - is now greater. This may cause the assailant to abort their attack in favour of finding an easier victim later on. An assailant who approaches you directly may appear to be very friendly at first as an attempt to still yet take you by surprise. They may ask you for directions, or for a light, in a very friendly manner in the hope that you will drop your defences and allow them to get closer. When close enough they will then launch their assault, either verbal or physical. It is very common for an assailant to begin their attack with a barrage of swearing and verbal abuse. The assailant may wish to frighten you in order to get you to comply with their requests (give them your money etc. ), or they may simply be after a fight, in which case the verbal attack is being used in order to soften you up. It may also be that your would be assailant is not overly sure of their ability to beat you and hence the verbal exchange is an "interview" of sorts, that will help them to determine the risk of engaging in a fight. Either way, the important thing to note is that there is very likely to be some kind of verbal exchange before a fight begins. It does not take a psychic to see when an attack is about to commence. Your assailant is likely to do a number of the following when their verbal aggression is about to escalate to the physical. Look for a change in skin colour, rapid breathing, an aggressive facial expression or stare, a clenching or shaking of the fists, pointing or pushing, a change in voice tone or pattern, excessive swearing, insults or challenges. Many of the techniques within the katas incapacitate the opponent at this early stage. Although the attack has not yet escalated to the physical, it makes little sense to wait until it does. When analysing Kata, it is important to understand that many fights will begin with the protagonists involved in a verbal exchange as one, or both, attempt to close the distance. Action is always faster than reaction. In a real fight you must never allow the opponent to gain the advantage. You must be the one who takes control of the situation and you should not simply "respond" to your opponent's actions. If you allow the opponent to land the first punch they will most likely be the winners. Whilst in karate much store is placed in "Karate ni sente nashi" or "there is no first attack in karate" I feel this statement needs closer examination. Most people interpret this statement as an instruction to let the opponent launch the first attack - which is a suicidal strategy in a live fight - but it is my belief that "Karate ni sente nashi" is a far more profound message which does not require the karateka to act in such a suicidal fashion. See my article "No First Attack in Karate?" for further details. Modern day sparring matches tend to be conducted with the combatants outside kicking distance. From there, one or both of them will close the distance, execute a few techniques and then move back out again. This exaggerated distance is also often employed during pre-arranged sparring. Real fights typically begin at punching / conversation range and rarely, if ever, have the back and forth motion seen during a boxing match or a karate tournament. A few punches will be thrown, and if none should stop the fight, it will quickly collapse into grappling range. Once the combatants have latched onto one another, moving back to punching range will not be possible due to the opponent's grip keeping them in close. The techniques within kata are for use within real fights and hence the majority of kata applications are for dealing with an opponent who is close up. It is also important to understand that because most fights involve some form of grappling, so do the applications of the kata. In a real fight, it is highly unlikely that the opponents will use techniques such as Oi-Zuki's or Mawashigeris. Karate is a civil tradition and hence kata contains very few techniques for dealing with the skilled combinations of a trained fighter. Kata is all about defeating an attacker in a real life civilian encounter. Kata is not about winning trophies in the rule bound arena or about defeating a warrior on a battlefield. As martial artists we spend a great deal of time practising with, and against, practitioners of the same discipline. As a result boxers get good at fighting boxers, Judoka get good at fighting other Judoka, and Karateka get good at fighting other Karateka. The techniques within kata are designed for use against the violent and untrained not other martial artists. Kata techniques are most often counters to attacks such as wild swings, grabs, tackles etc. Any kata application that is interpreted as a defence against a lunging punch or other such karate technique is incorrect. Real fights are not choreographed like the fights in films, nor are the combatants limited to a certain set of techniques as they are in sporting matches. Real fights are not visually pleasing and are extremely sloppy, fast and crude affairs. As martial artists we spend a great deal of time trying to perfect our techniques. A well-executed technique is very often visually striking to those who witness it. In a real fight, the opponent will not "play ball" in the same way a compliant practice partner would and hence the technique will not be as pretty in appearance. What is a graceful movement when performed in the kata, or against a compliant practice partner, will become rough round the edges when applied in an all out situation. A technique that is very easy to apply on a compliant practice partner may become next to impossible on a live opponent. In particular, the accurate placement of blows becomes much more difficult. The more complex a technique, the greater that chances of it failing in a real situation. It is also important to understand that the effects of the huge adrenaline surge you will experience in a live situation will greatly reduce your ability to perform complex tasks (See Geoff Thompson's books, "Dead or Alive" & "Fear"). The techniques of the katas are should be relatively simple to apply. Should a suggested kata application be overly complex, or if it is reliant upon the opponent behaving in a certain way, it is extremely unlikely to work and hence is incorrect. Once a fight has begun, it is most often decided by who lands the first solid blow to the head. The head controls all and hence it is the prime target in order to end the fight as quickly as possible. As a result of this, one would expect the majority of strikes contained within the katas to be directed at the opponent's head - which they are! At first glance it may appear that many punches are aimed at the opponent's chest. This is not the case however, as most of the "middle level" punches are preceded by techniques that will cause an opponent to buckle at the knees or bend at the waist. These techniques will bring the opponent's head down, such that it is in line with the kata practitioner's chest, and hence what appears to be a middle level blow is in fact aimed at the head. A - The head is very mobile and hence can be difficult to strike in a live fight. B - The bones of the skull are far denser than the bones of the hand, and hence punching the skull with a clenched fist may well result in a broken hand. A - Hand conditioning was regarded as a vital part of the original karate. B - Many of the strikes that are now punches were originally palm-heels etc. but were modified as the result of Master Itsou's changes (making the kata more suitable for children). C - If, when defending yourself in a real situation, all you suffer are damaged hands, then you have done very well indeed! In the unlikely event that you get the room to kick, attempting a high kick is almost certain to end in disaster. As soon as you take a foot off the floor you are unable to move and easy to unbalance. The higher you lift your foot the more vulnerable you are. In a real fight your aim is to win - not to look good! In a real fights all kicking techniques should be kept low, ideally lower than the level of the finger tips when the arms are down by the side. Low kicks are harder to block, they do not have as far to travel and the chance of the kicking leg being caught is greatly reduced. The practice of kicking low is one that is encouraged by the katas. Many of today's karateka kick high during the performance of their kata, presumably for visual effect, however it is vital to remember that originally all the kicks were low. Although there are exceptions, the majority of fights are over almost as quickly as they begin. It is a rarity for live fights to last more than a minute at the outside. More often than not, the winner of the confrontation will be decided in the first few seconds. One of the combatants will be rendered semiconscious by a solid blow to the head and from that point on they will be at the mercy of their opponent. This is an important fact when attempting to understand kata. If most fights only last a few seconds, how many techniques do you need to know? Knowing thousands upon thousands of techniques is not only unnecessary but it can be downright harmful! For a technique to be useful in a live fight, the practitioner needs to be able to apply that technique with little or no conscious thought. If the practitioner has to choose from the thousands of differing techniques available to them, they will stall whilst the brain makes this decision (during which time the situation will no doubt have changed) and hence their opponent will be given the advantage. The katas provide instruction on a key number of techniques and concepts. They do not try to provide a technique for every conceivable situation, as to do so will prevent those who practice them from responding quickly and appropriately in a live fight. Each and every kata is designed to be a stand-alone system that will instruct those who practice them in the key concepts and strategies of the systems (katas) founder. Do not attempt to learn an infinite number of techniques but instead try to understand the principles upon which the techniques of Karate rest. It is far better to know very little, very well, than it is to know a great deal superficially. It is this approach that will lead to success, and hence this is the approach adopted by the katas. As mentioned previously, action is always faster then reaction. Blocking works fairly well at long range when the opponent is limited to a finite number of techniques (as in a karate tournament). Blocking also works well when you know exactly what technique the opponent is going to use. Neither of these situations is likely in live fight. It is almost impossible to block and counter an opponent's punches at close range in reality. The idea of blocking and countering is one that many modern martial artists are reluctant to give up. If you have any doubts, I suggest that you get a partner, put on a pair of 16oz boxing gloves and go for it! Have a go at blocking and countering and I guarantee you will get trounced. From this we can conclude that the katas are unlikely to contain much blocking. Now again this may be surprising, as many modern interpretations of the katas would have every other move as a block. If you remember that at the start of the 1900's, Itsou began teaching the katas as mainly blocking and punching as a way to conceal the dangerous techniques they contained. Prior to this time the large karate classes - with which we are so familiar today - would not have existed. As the number of students grew, so did the need for a common terminology. The terminology that was adopted was the one used by Itsou at that time, and hence many of the techniques that are currently labelled as blocks were never actually intended to be used as such. 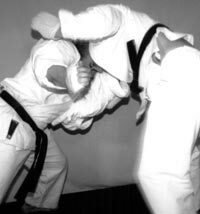 That is not to say there are no defensive techniques within the katas, as there are, but the katas do not contain what is commonly thought of as a "blocks." All the defensive techniques within the katas are designed such that the initiative is regained and the opponent is placed in a position of disadvantage. Blocks merely attempt to stop an opponent's attack (in the unlikely event that they work) and do nothing to secure a position of advantage. In a real fight there is no limit of the techniques that can be used and there will be no referee to ensure fair play. Real fights are violent and thoroughly repugnant affairs. Your opponent can bite, gouge your eyes, seize the testicles, spit, use weapons etc. Losing a real fight can result in permanent physical or mental damage, or even the loss of your life. In combat you have to be prepared to use violent and repugnant methods when it becomes absolutely necessary. Many of the methods in the katas are as brutal as they are effective. It must be remembered that the techniques and concepts recorded within the katas are for use in the extreme danger of unprovoked attack. Real fighting is not pretty, and hence neither are the methods recorded in the katas. It is also important to understand that the opponent in the street will not respond in the same way as an opponent in a sporting contest. In a civilian self-defence situation, the assailant is very unlikely to be a martial artist and hence will not use complementary techniques, respond to feints, counter is expected ways etc. The techniques of the kata are all about defending ourselves in real situations. When studying bunkai, any mention of feints, skilled counters etc. is a good indication that the particular application in question is incorrect. It is vitally important you understand the nature of live fights if you are to successfully understand your katas. Most karateka do not engage in realistic training and hence do not see the errors in their interpretation of the katas. The founders of our art were all experienced fighting men who had used and relied upon their skills in real situations. They lived in violent times where the acquisition of fighting skills were a must if they wished to take care of themselves and their loved ones. The majority of people in today's society do not have to face violence on a daily basis and hence have no idea of what it is like. When these same people fail to study the art of karate in the required depth, and hence fail to understand the advice and methodology of the past masters, they start to make assumptions about the nature of violence. They misinterpret the art so that it becomes - in its mutated form -woefully inadequate. There are some of today's martial artists who fully understand violence due to the experience they have gained during the course of their employment in the fields of security and law enforcement. We need listen to their hard won advice and use it to keep our training upon the right track. One thing that always strikes me is that these modern day masters of self-protection are rarely at variance with the founders of karate. The masters of old understood real fighting and that is reflected in their writings and in the katas they left behind. If we practice the art in the manner its founder's intended, then karate is a very potent system.